Citizens of the nearly 4-million strong metropolis can surely celebrate that Addis Ababa will finally get a proper sports stadium. The one at the heart of the city is derelict and urgently needs replacement. However, new project means trouble for thousands of inhabitants, mostly illegal squatters, who have established a significant settlement on the site in eastern Addis Ababa. It is there, next to the city’s bypass and very close to the international airport that the new sports-commercial complex is to be built. A plot of 60 hectares already now has a sports centre on it, but much of it will either disappear or get redone (as seen below). Preparatory works have began and houses are being demolished to make way for the new buildings. Should the estimates by Ethiosports.com prove correct, the new stadium for 60,000 people may cost as little as ETB 1.6 billion (€61m / $83m). It is to be based largely on sloped land with a partly sunken bowl, but such a price tag is still exceptionally low. 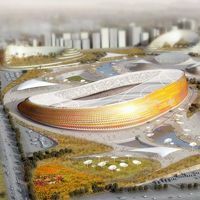 Most of the seats are to be covered and the stadium itself, resembling a crater, is to have a shiny mosaic covering it. Current athletic stadium on the site is to be remodeled and also get a crater-alike look. Also other parts of the complex (office/commercial and hotel buildings) are to get a dynamic design, matching one of the main stadium. The design by LAVA / JDAW was selected by central authorities in 2012’s international competition. Already then it was planned to begin works in 2014, so current preparations confirm the plan is on track.